Ah – there’s that passion word again. It’s what Signalyard was founded on – passion-centric marketing. And it’s on passion that I do agree wholeheartedly with the Economist. Personally, I don’t buy cycling being the new golf any more than I bought golf being the old golf. Golf remains a sport that some people (myself not amongst them) are passionately engaged by. And engaging people through their passions, whether on the golf course, the cycle track or out on a ride, usually proves highly effective. “Google, Yahoo, all the tech companies, they’ve now got executives who are mad keen cyclists. They love cycling’s metrics, all the measurements that are available, from heart rate to power; they love the ‘toys’, carbon road bikes are beautiful pieces of technical equipment; and they love the community angle, cyclists sticking together. They also love the fact cycling is so conducive to travel and exploration. The top tech guys in America love travelling to Europe and often take their bikes.” So says exercise physiologist and former pro triathlete Matt Dixon, who now coaches athletes and serious amateurs, including a number of Silicon Valley’s top executives. One of the great pleasures of using cycling, running and skiing as a way to engage broader audiences is that I get to talk to people who are passionate about those sports. Here at Signalyard, I can turn up to meetings in lycra without raising an eyebrow. Whether the meeting is with an insurance company or a car manufacturer, because we’re talking about engaging people through the universal language of cycling we find it easy to engage clients in the same way. 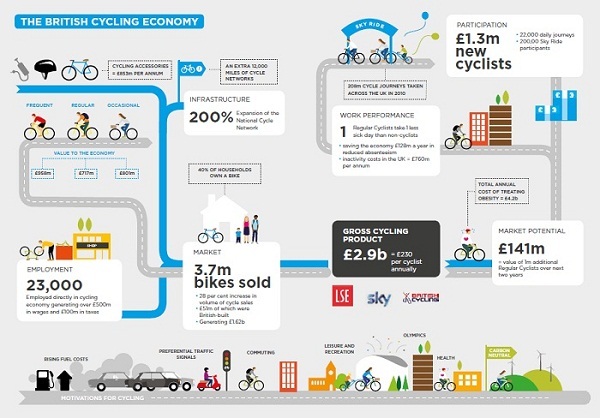 Of course cycling is itself a major business sector (with over 3.7 million bikes sold each year in the UK) delivering wider socio-economic benefits to the UK (worth £2.9 billion a year to the UK economy according to the LSE’s Gross Cycling Product report). But using cycling as a way to engage people has the potential to grow each of those figures faster still. It’s a way in which we can make cycling even more an everyday part of how people connect, making the simple, universal pleasure of riding a bike in the open air be even more a normal part of life. It’s a way we can get more people onto more bikes. And it’s a way in which we can boost the effectiveness of marketing. Cycling may well be the new golf. But that’s only the beginning.